We’re not really into desserts but occasionally make meringues for guests. Recently we had some left over and used a grate of blackberries to make a boozy sauce to stir through them with some whipped cream. Avoid the temptation to over-mix as this looks prettiest when the components are lightly swirled together. Put about three-quarters of the blackberries into a pan with the sugar and cook over a low heat for a few minutes until the sugar has dissolved and the blackberries are starting to soften. Add the liqueur. Allow to cool before stirring in the reserved blackberries. Break the meringues into a large bowl and mix in the whipped cream. Swirl some of the blackberry sauce into the meringue mixture then divide into 6 bowls. Spoon the rest of the blackberry sauce over the individual dishes. We’re getting late in the strawberry season, so they’re both cheaper and have great flavour. This is an easy ice cream by Diana Henry with a texture similar to sorbet. Great on its own but we also loved this with some rich chocolate truffle ice cream laced with rum. Remove the green tops from the strawberries, then slice and put into a bowl with half the sugar and the seeds from the vanilla pod. Leave to sit for half an hour. Pour the fruit and all its juice into a food processor with the remaining sugar and whizz to a purée. Push the purée through a nylon sieve to remove the strawberry seeds. Mix with buttermilk, sour cream & salt. If you have an ice cream machine you can churn in that or alternatively transfer to a shallow container and put straight into the freezer. You will need to churn it manually by putting back into the food processor after an hour, then twice more at 2 hour intervals. The ice cream must be covered with a lid or cling film in between churning and when you store it. Remove the ice cream from the freezer about 10 minutes before serving to allow soften a bit. This is hedonistically rich and full of flavour; Jono thought it was devine and Julie thought it was all a bit much. A conversation piece at least to end your next Middle Eastern feast. Whizz 150g of the pistachios with the sugar in a food processor until finely ground. Put the milk, cream, honey, orange blossom water and the pistachio mixture in a saucepan and bring to a gentle boil. Simmer gently for 20-25 minutes or until reduced by a quarter. Keep stirring to prevent it boiling over. Set aside and leave to cool. Chop the remaining pistachios. Add the evaporated milk to the cooled mixture and stir in the grated orange rind and chopped pistachios. Mix well, then chill in the fridge overnight (or for a minimum of 2 hours). Pour the chilled mixture into an ice cream machine and churn for 25-30 minutes. If you don’t have an ice cream machine, pour the mixture into a large shallow container and freeze for 2 hours. Remove the container from the freezer and fork through to break down the ice crystals, then freeze again until firm. This would probably have been more useful a few weeks ago when you still had some panettone leftover from Christmas. Much fancier than the standard version! Preheat the oven to 160C/gas 4/fan 140C. Grease an 850ml baking dish with a little butter. Cut the panettone into wedges and butter the slices lightly with the remaining butter. Cut the slices in half and arrange in the dish with the buttered side up. 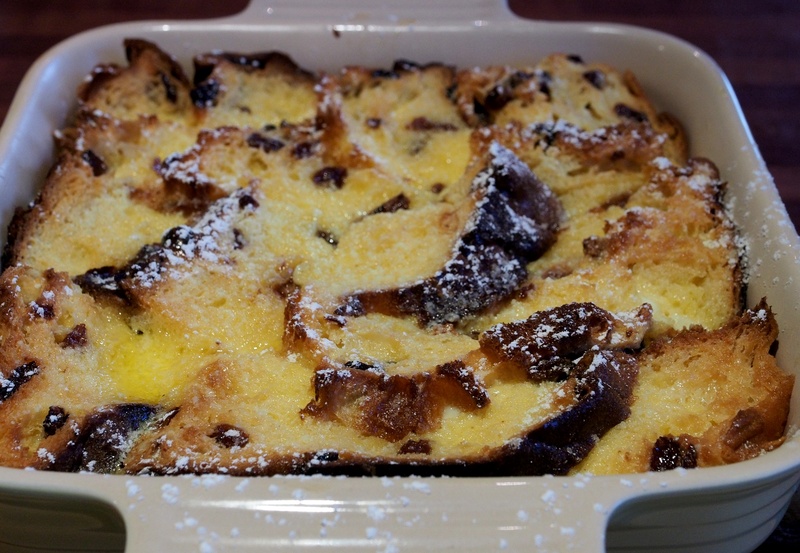 Whisk together the eggs, cream, milk, vanilla extract and sugar and pour evenly over the panettone. Put the dish in a roasting tin and pour hot water around to a depth of about 2.5cm. Bake for 35 minutes or until just set and browned on top. Dust with icing sugar and serve with whipped cream. We find Rick Stein exceptionally reliable and when we needed a dessert for entertaining thought we’d give his recipe a go. Unsurprisingly they worked a treat and the result was a silkly, rich, and indulgent pot of chocolate to finish a meal with friends. Wine Suggestion: Chocolate is notoriously difficult to pair with wine so we’d probably skip the wine altogether and go for a liqueur to complement this dish – Grand Marnier, Cointreau, Whiskey… choose your poison. 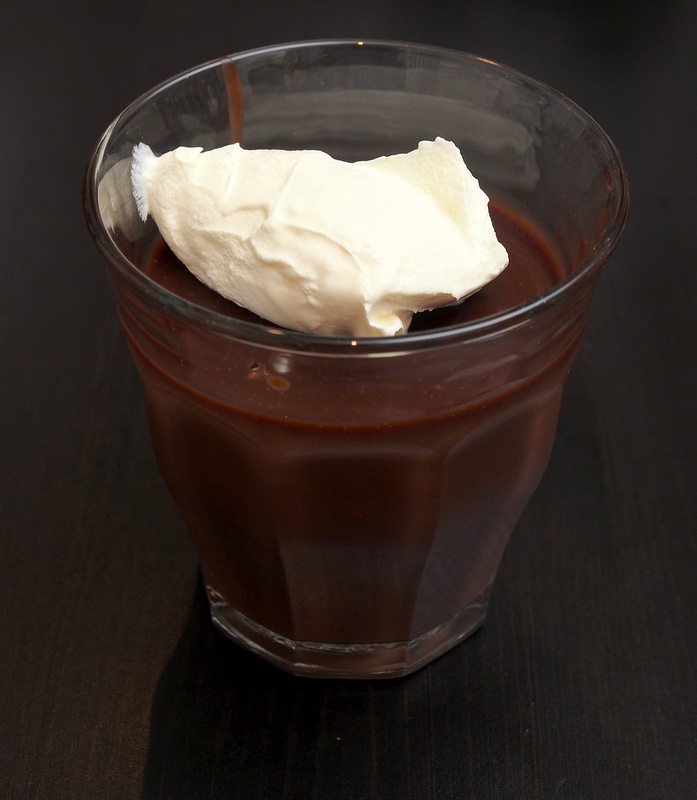 Break the chocolate into a heatproof bowl and melt over a pan of just-simmering water. Remove and stir until smooth, then stir in the softened butter and egg yolks. Put the cream, milk and sugar into a small pan, bring to the boil and then stir into the chocolate. Pour the mix into six 100ml receptacles (we used small glasses but you could also use espresso cups or ramekins) and leave somewhere cold to set, but don’t refrigerate. Decorate the pots with a little quenelle of crème fraîche and dust with cocoa powder to serve.